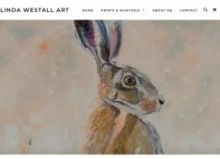 Linda Westall is an equestrian artist in Hampshire where she lives and offers her equestrian oil paintings for sale. Linda has a great love of horses and the equestrian artist creates paintings which are unique to her style. Linda is a contemporary horse artist and her work is mainly painted in oils as she loves the fluidity this medium creates to give the desired effects. Linda takes on commissions for horse portraits as well as various animal portraits in Hampshire and can work from photographs if clients prefer. Linda also paints people, flowers and landscapes and takes inspiration from cultures and her travels around the world for her work.